AL8B Premium 18 SEER R-410A Split System Air Conditioner (AL8B) The Premium Series AL8B models are the outdoor part of a versatile air conditioning system. They are designed to be custom matched with one of our complete line of evaporator sections, each designed to serve a specific function. Matching air handlers are available for upflow, downflow, and horizontal left or right applications to provide a complete system. Alternately, add-on coils are available for use with modular air handlers or upflow, downflow, and horizontal furnaces. Electric heaters and field installed accessories are also available as needed. Superior Coil Protection - A stamped, decorative metal coil guard protects the tube-in-fin coil from debris and other damaging material. Protected Compressor - The compressor is safeguarded against abnormal pressures and temperatures by an internal pressure relief valve, an internal temperature sensor, and factory high and low pressure system controls. A factory installed liquid line filter-drier further protects the compressor against moisture and debris. Environmentally Friendly Refrigerant - The next generation refrigerant R-410A delivers environmentally friendly performance with zero ozone depletion. Durable Finish - An automotive quality finish provides the ultimate protection from harmful UV rays and rust creep, ensuring a long-lasting, high quality appearance. A powder-paint topcoat is applied over a baked-on primer using a galvanized, zinc coated steel base material. The result is a finish that has been proven in testing to provide 33% greater durability than conventional powder-coat finishes. Sound Reducing System - Features combination of swept-wing fan, composite base pan, isolated compressor compartment, and two-stage compressor to reduce overall sound to a mere whisper. Low RPM ECM Fan Motor - Helps to reduce airflow noise. Swept Wing Fan - A fan design boasting technology adapted from aeronautic and defense engineering provides for whisper-quiet operation by allowing air to flow smoothly and efficiently across the fan tips. Composite Base Pan - The strong and durable composite base pan provides added strength while resisting rust and corrosion, as well as reducing sound and vibration. Isolated Compressor Compartment - A molded composite bulkhead isolates the refrigeration components and the compressor from the rest of the unit, reducing sound and vibration. Lower Installed Cost - Designed to provide enhanced installability by featuring a slide-down control compartment that allows easy access to control components, along with angled service valves to reduce overall installation time and cost. Factory charged for a 15 foot lineset. Factory Installed Filter-Drier - A factory installed, solid core liquid line filter-drier removes harmful debris and moisture from the system. Easy Service Access - A full end, full service access panel with handle makes for easy entry to internal components. 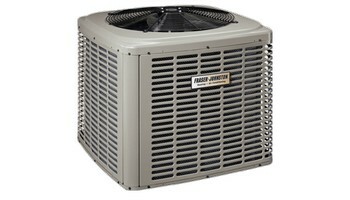 Premium System Warranty* - Limited lifetime compressor warranty when registered online within 90 days of installation.